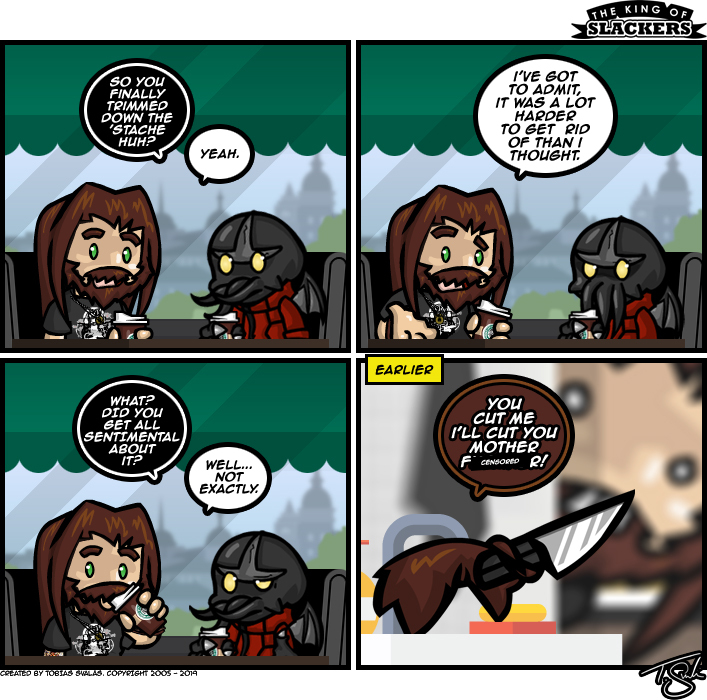 King of Slackers » Archive » I’ll Cut You! So the past summer I decided to just let my facial hair grow wild over my summer vacation. Sounds like a fun idea. And then I decided just to leave it for now. “For now” turned out to be a couple of more months and… Let’s just say that it got pretty wild at the end. Anyway, while trimming down my beard I figured… “I haven’t had this magnificent mustache growth ever. I should just save that bit”. And so I did! I spared the ‘stache! Well up ’til a few weeks ago when I decided to trim it down. And this is the scenario that played out in my head while i trimmed it down. Because I’m deranged that way.